Compiled by Dr. Beth Gott of the School of Biological Sciences, Monash University. All over Australia, Aborigines had their own local yearly calendars. Just as the climate in Kakadu is very different from that of Melbourne, so the Wurundjeri had their own way of marking the changing seasons. The division of the year into four seasons comes from Northern Europe, and does not fit Melbourne. We still think of winter as an unfavourable season for plants, when northern European trees drop their leaves and become dormant, but for our native plants, especially the small tuberous herbs, winter is a season of growth. At this time the bush is green, and the temperatures are rarely low enough to stop growth. The unfavourable season is high summer, when water is scarce, and much of the ground flora becomes brown and dies off. Water-plants such as Cumbungi are usually green during the summer, they die off during the winter. Alan Reid originally suggested a calendar for the Middle Yarra region which has six seasons. Autumn, Winter, Pre-spring, True Spring, Early Summer and Late Summer. Glen Jameson (Victorian Naturalist 1996, Vol. 1 13 pp.26,67,123,269,313. 1997, Vol. 1 14, p.4S.) has modified this to: Late Summer, Early Winter, Deep Winter, Early Spring, True Spring, and High Summer, and has given lists of many plants and animals to be found in each of these seasons. Alan Reid agrees with Jameson, but emphasises that the seasons vary from place to place - for example the coastal seasons of the Bunwurrung would have been different. Jones, Mackay and Pisani, from the University of Adelaide (Jones, D., Mackay, S. & Pisani, A. 1997 Patterns in the Valley of the Christmas Bush: a seasonal calendar for the upper Yarra Valley. Victorian Naturalist 114(5):246-249.) have proposed a seven season calendar. This has Kangaroo Apple Season (December), Dry Season (Jan-Feb), Eel Season (March), Wombat Season (April-August), Orchid Season (September), Tadpole Season (October), Grass-flowering Season (November). The Museum of Victoria has chosen to follow this pattern in its displays in Melbourne and at Coranderrk. The Museum have named the seasons after the Woiwurrung language names for eels, wombats, and orchid, tadpoles and grass, but it is not known if these names were used by the Woiwurrung. All the above are attempts to find the natural seasonal divisions of the area based on modern observations. Although William Thomas gave some seasonal happenings, that also did not represent the Aboriginal view. In the seasonal descriptions which follow we have combined elements of Jameson and Thomas, and have tried to include the activities of the people. Lifestyle depended very much on the rhythm of the seasons. People moved over their extensive territories in regular cycles, maximising the availability of food and shelter. When food was plentiful there were opportunities to carry out ritual responsibilities and opportunities for ceremonial gatherings. They were always mindful of the seasons in selecting the localities in which to spend their time, taking into account not only the natural features of the ground, but the facilities for obtaining food. Much was known about the stars and the seasons. People could read the sky. For example, they would know that when a particular constellation appeared it was time to hunt a particular animal, or dig up a particular plant. See Thomas v.21, p98 "they are great observers of the starry heavens" for details. The flowering of particular plants was often used to mark seasonal events. Even today, fisherman use the flowering of the Coast Tea-tree in early November to mark the entry of Snapper into Port Phillip Bay. We will start our survey in March, because this marked the end of the dry summer. Late Summer, February - Mid March. After the dry hot summer, the Autumn rains arrived and the days became cooler. People started burning those parts of the land where the scrub or tussock grass had become too dense during the summer, but they were advised by their elders where and when to burn, taking the weather into account so that the fires did not spread too far. It was important to clear the undergrowth and provide fertilising ash so that the small tuberous food plants could grow well after the rains came in March. Burning also made it easier to catch animals. 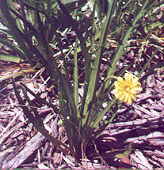 Plants which had suffered from lack of water during the summer were now able to renew growth. DJAAK, Wattle gum , was plentiful, and in the middle of this month the WARRAK Banksia or Honeysuckle, Long-leaf Box and Silver-leaf Stringybark came into blossom, providing sweet nectar, and attracting birds. March has been called the Eel Season, because the female Short-finned eels were moving down the streams to the sea; the male eels had been leaving in smaller numbers during the spring and summer. These were an important food, and among the vegetables there were the starchy roots of the water plants, which began to die down after their summer growth. Some late summer fruits such as mistletoe berries were also available. Birds started to flock before heading north for the winter, to be replaced by other birds which will soon start to arrive from Tasmania. Early Winter, April & May. All sorts of fungi appeared with the rains, while the ground was still warm. BUNJIL, the Eagle, was building his nest, and the Brush-tail and Ringtail Possums were mating. Bolin Bolin billabong started to fill. Many different moths emerged, and were food for birds during the day and for Sugar and Feathertail gliders at night. Eastern Grey Kangaroos and Wallabies fed on the new growth. This cold time of the year slowed down but did not stop plant growth. Animals such as Echidnas were breeding, birds nesting. The flats near the rivers and creeks were often flooded; and the low lands generally were wet and cold, and unsuitable for camping, so people moved to the best sheltered spots on the uplands, where they were able to catch koalas, possums, and wombats, and to find grubs in the trees The leaves of the water plants had become dry and brown, but the small tuberous herbs were green and growing; the roots of both were good food. Fragrant nectar came from BURGILBURGIL, Honey-pots, Acrotriche serrulata, a small shrub which hid its flowers close to the ground. BULAIT- Cherry Ballart formed fruit. People constructed good bark WILLAMS (shelters) and kept fires burning for warmth. They wrapped themselves in rugs made from possum skins. As early as mid-July, MUYAN, Silver Wattle, started to flower, the first of the wattles to do so. It earned the name of 'Barak's Wattle' because when he died at Coranderrk on August 15th 1903, MUYAN was in full golden bloom. Yellow Box also flowered, providing much nectar. Early Nancy was the first of the small food plants to flower, and by late August the MURNONG was budding. People moved slowly towards the lower lands as the spring temperatures rose, there they were able to snare ducks, to catch other kinds of wild-fowl, and, as the season advanced, to get eggs from the nests of all kinds of birds. This was a time of plenty. Lilies, Orchids and MURNONG flowered , and still provided root vegetables. Greens were consumed in large quantities. Flowers were everywhere -Wattles, Hop Goodenia, Burgan, Kangaroo Apple, as well as orchids and small lilies which had been building their tubers over the winter. Snakes and Lizards became active, young Kangaroos came out of the pouch. Migrant birds - the Sacred Kingfisher for example, returned from the north. Tadpoles appeared in ponds, and the river, fed by melting snows from the mountains, flowed into the flood-plains and replenished the billabongs. Water-plants put on green leaves. Nowadays this flooding is prevented. WARRA WARRAP/GARRONG, late Black Wattle, with pale yellow blossoms, flowered in November. As the summer advanced, the land began to dry, and people congregated around the reliable water-sources, the creeks, rivers and billabongs. Fish was an important food - Galaxias moved up the river from the sea. Where rocky falls blocked the river, as in the Prince's Bridge area and at Dight's Fails, fish would accumulate in large numbers, and could be easily taken. Eels started to come downriver. Fish traps were set. Water sources were important for the wildlife, so large animals such as Kangaroos and Emus would come to drink and could be caught. Lizards and snakes were active. Grasses flowered - Kangaroo Grass, Wallaby Grass, Spear Grass, Tussock Grass and the Common Reed. Fruits ripened -, MORR - Currant-bush, GARRAWANG - Apple-berry, White Elderberry, Kangaroo Apples and sweet LAAP - Manna, could be collected beneath the WURUN - Manna Gums The small tuberous plants died back, but the women still knew where they could dig for their roots, which at this time were at their best. . When people went up into the mountain gullies to get firedrills, they ate the pith from the centre of the treeferns. In the warm weather, big shelters were not needed unless it rained. As food was plentiful, large gatherings of the tribes and clans took place. With permission from Bunurong clans, people went to the sea-coast to swim and gather shellfish and the fruits of Pigface and Coast Beard-heath. Flounder and Flathead could be speared or netted in the shallows, and shellfish were gathered. The Dandenong Ranges were the hunting grounds for both the Bunurong (Western Port tribe) whose land lay to the south, and the Wurundjeri (Yarra Yarra) tribe whose land lay to the north and west. When the first pastoralists came: Blacks from the Western Port and Yarra Yarra tribes were frequently seen during the summer months, hunting in the forest for wallaby, possum and koalas. Our knowledge of pre-European life in Victoria is fragmentary and sometimes confusing. Below is listed some of the names of Aboriginal seasons as recorded by three writers working separately during the nineteenth century. Graphic by Damian Curtain & Stanley Barker.